Today was Father’s day so my feed was already clogged up with mawkish messages to/from my friends who are fathers and especially new fathers and fathers-to-be – and fair enough, it is their day. Well this was the day that Facebook went a step further and started poking me in the eye with my infertility, uninvited. I got an advert for an infertility service. 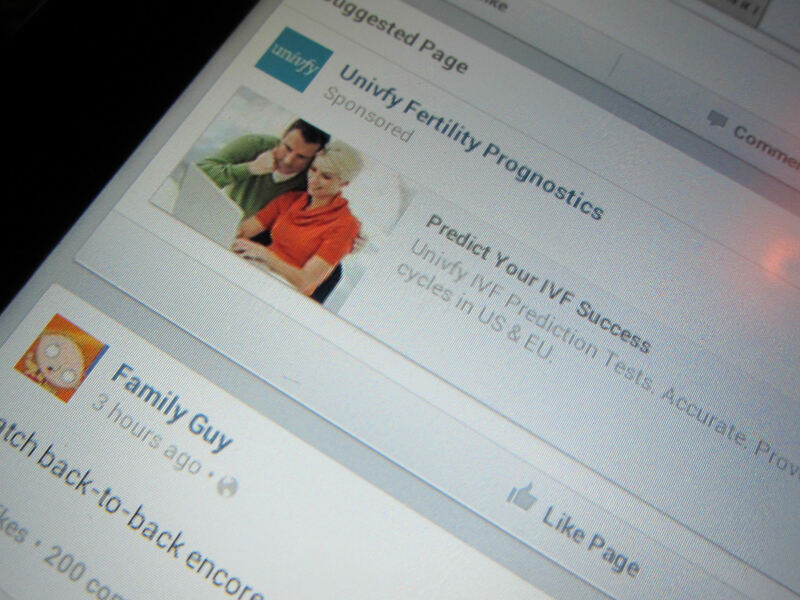 I certainly haven’t mentioned my infertility status on Facebook. Ever. I guess Facebook used some combination of cookies and demographics and knew I was married and childless in my 30s so thought I might be infertile. It was correct. Its advertiser Univfy must have then thought that as a (probably) infertile person I’d like a bit of advice about infertility from them. It was incorrect. It hurt me, I’m not exactly sure why. Well firstly, the advert was entirely unsolicited. I had thought I was on top of Facebook, I thought I knew what the surprises were going to be. This was a new one. I didn’t like it, I didn’t like that I wasn’t in control of it but that it was there in my feed anyway. I know that I’m the only one that sees the adverts on my feed, but I want to be able to prepare myself for what I might see there. Certainly it surprised me, popping up unannounced. It felt invasive and exposing like I’d been ‘found out’ and the idea that I can be identified as an infertile person so easily came as a shock. I felt singled out and pointed at by a faceless organisation saying ‘we know your deepest darkest secrets, we know things about you that less than 10 of your 497 Facebook friends know’. I suppose infertile people need to get information about infertility services some way, and I guess some people in my situation would be pleased to have the information come directly to them. I’m sure Univfy does roaring trade and helps a lot of people. I work in marketing, I entirely understand why any advertiser would use targeted marketing this way. But for this subject-matter I didn’t like it and it would put me off using the organisation in question. I think, well for me anyway, it’s not the right channel for the message. As I say, Facebook is a sore point for a lot of infertile people so I wouldn’t have thought that an IVF service would want to be making it worse for people. I’m going to email this blog post to them, so they can consider my reaction in case it is of broader relevance to their marketing decisions.